Treating stains on Oriental and Persian rugs, spills and accidents should be addressed immediately. But, DO NOT USE over-the-counter spotters found in drug, grocery, and home improvement stores. These spotters are too aggressive and can leave irreversibly discolored areas. Instead, use cold water or club soda as an emergency measure until a professional can clean the rug. As well if you have spilled red wine on the rugs, use white wine on the spill to reverse the red wine color, blot with a white towel, rinse with water and place a folded white towel on the spot with a heavy item on top of the towel and walk away. As the rug is drying the moisture will capillary into the towel. Please do not hesitate to call us for advice, we can walk you through the emergency until we can clean the rug. 613-232-5110. 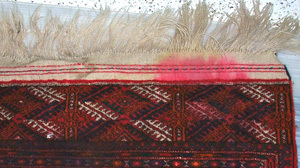 Remember treating stains on Oriental and Persian rugs is a serious matter and should be tended to immediately. Rug padding provides a protective layer between your rug and the floor. A pad helps minimize slippage, increases the life of the rug, makes the rug feel thicker and more luxurious and absorbs noise. 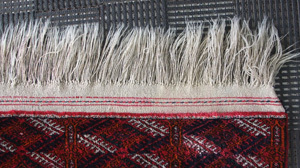 Read more about rug under pad and how it can help protect your precious rugs.